Mabuhay! 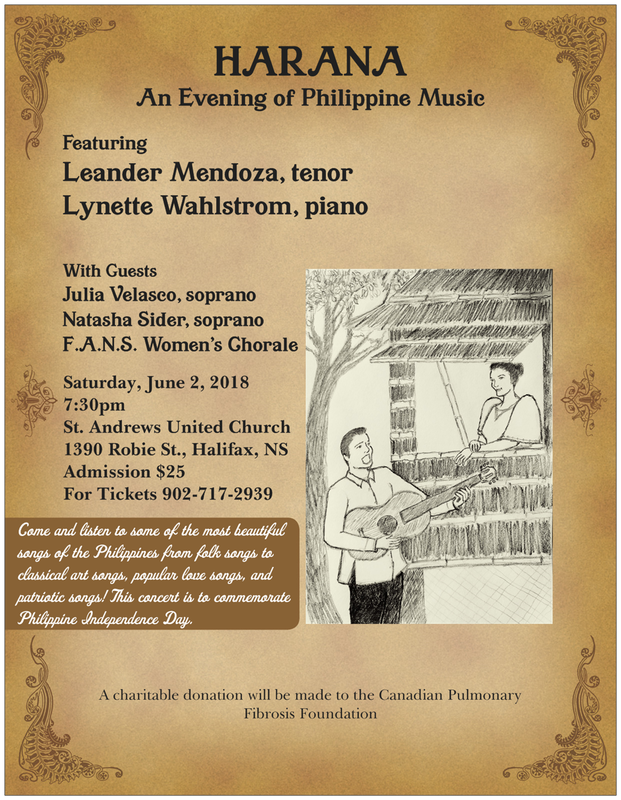 On Saturday, June 2, 2018, I will be giving a concert entitled, "Harana, An Evening of Philippine Music", at St. Andrew's United Church (1390 Robie St., Halifax), at 7:30PM. Accompanying me at the piano is Lynette Wahlstrom. My special guest performers are sopranos Julia Velasco, and Natasha Sider, and the Filipino Association of Nova Scotia Women's Chorale. A charitable donation will be made to the Canadian Pulmonary Fibrosis Foundation from part of the proceeds. Come and listen to some of the most beautiful songs of the Philippines from folk songs, classical art songs, love songs, novelty songs and patriotic songs! 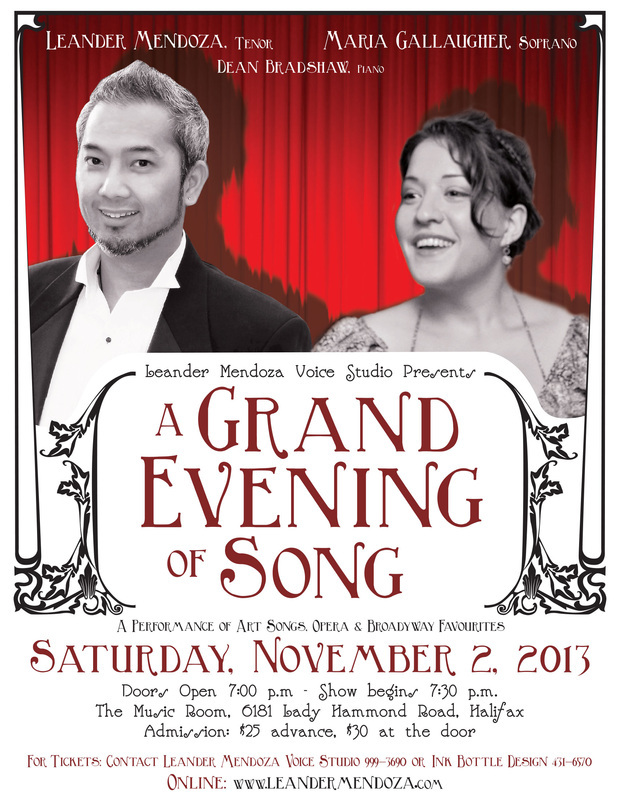 "A Grand Evening of Song"
An evening of Art Songs, Opera Arias, Operetta, and Broadway favorites. League Savings & Mortgage Company (Credit Union)has kindly offered their parking lot for use after 6pm. They are located at 6074 Lady Hammond Rd., beside Tim Horton's. Before 6pm limited parking is available on the side streets in the vicinity of the Music Room. Go to the A Song for an Angel tab. Please come and support this fund-raising event! A Mother's Day concert in Miramichi, New Brunswick to support The Mount St. Joseph Foundation. With very special guests Ms. Susan Butler and the St. Michael's Choir. One night engagement featuring Nadia Moore & Leander Mendoza at one of Halifax's popular pubs/restaurants, Stayner's Wharf. Dinner will be served at 7:30PM, and show will start at 9:00PM until midnight. This is a one night only event as the world-renowned Filipino-Canadian soprano performs her favourite songs, with special participation of some of her past and present students, including Leander Mendoza and accompanied at the piano by Eldon McBride. Li'l Boo Music Studio and Willxpress proudly present a very special evening of memorable music and singing to honour all the mothers. The Filipino Association of Nova Scotia presents a Dinner-Show at ESTIA RESTAURANT on Spring Garden Rd. in Halifax, in appreciation of the Philippine Ambassador The Honourable Leslie Gatan and The Philippine Embassy Officials. Leander will be featured in a solo concert by the Mount St. Joseph Foundation, with special participation by Miramichi's very own, Susan Butler. The concert is a fund-raising project for the Mount St. Joseph Foundation headed by Iris Sullivan. Leander will sing sacred songs, Broadway, and some Christmas tunes to celebrate the coming holiday season! Location: St. Michael's Cathedral.